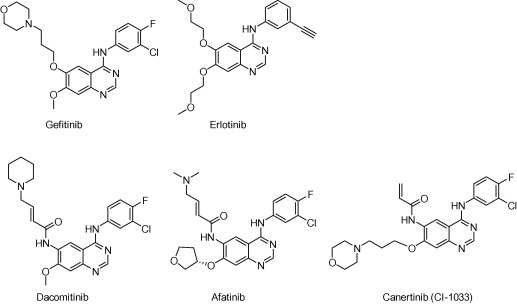 PF-06747775 is an orally available inhibitor of the epidermal growth factor receptor (EGFR) mutant form T790M, with potential antineoplastic activity. 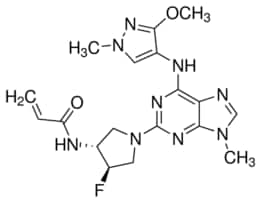 EGFR T790M inhibitor PF-06747775 specifically binds to and inhibits EGFR T790M, a secondarily acquired resistance mutation, which prevents EGFR-mediated signaling and leads to cell death in EGFR T790M-expressing tumor cells. Compared to some other EGFR inhibitors, PF-06747775 may have therapeutic benefits in tumors with T790M-mediated drug resistance. A suspension of 6-chloro-2-fluoro-9H-purine (5.49 g, 31.8 mmol, 1.00 eq), 3-methoxy-1-methyl-1H-pyrazol-4-amine hydrochloride (6.60 g, 40.34 mmol, 1.26 eq), and N,N-diisopropylethylamine (16.6 mL, 95.5 mmol, 3.00 eq) in DMSO (31.8 mL) was stirred at ambient temperature for 19 hr. The reaction mixture was then concentrated in vacuo at 50° C., poured into water (250 mL), and stirred vigorously at 0° C. for 1 hr. The resulting solids were filtered off, washed with ice cold water (20 mL), and dried for 16 hr at 50° C. to give the title compound (7.26 g, 87% yield, 96% purity) as a light yellow solid. 1H NMR (400 MHz, DMSO-d6) δ ppm 13.03 (br. s., 1 H) 9.21 (br. s., 1 H) 8.18 (br. s., 1 H) 7.74 (br. s., 1 H) 3.81 (br. s., 3 H) 3.71 (s, 3H). m/z (APCI+) for C10H11FN7O 264.2 (M+H)+. To a vigorously stirred suspension of 2-fluoro-N-(3-methoxy-1-methyl-1H-pyrazol-4-yl)-9H-purin-6-amine (7.25 g, 27.5 mmol, 1.00 eq) and potassium carbonate (7.61 g, 55.1 mmol, 2.00 eq) in 1,4-dioxane (92.0 mL), was added dimethyl sulfate (2.90 mL, 30.3 mmol, 1.10 eq) in a dropwise manner over 3 min. After 4 hr, additional portions of 1,4-dioxane (50.0 mL), potassium carbonate (3.80 g, 27.5 mmol, 1.00 eq), and dimethyl sulfate (1.00 mL, 10.4 mmol, 0.30 eq) were added to the reaction mixture. After a further 16 hr, the reaction mixture was concentrated in vacuo, diluted with water (120 mL), and stirred at ambient temperature for 1 hr. The resulting solids were filtered, washed with water (20 mL), and dried for 16 hr at 60° C. to give the title compound (6.42 g, 84% yield, >95% purity) as a light yellow solid. 1H NMR (400 MHz, DMSO-d6) δ ppm 9.23 (br. s., 1 H) 8.13 (br. s., 1 H) 7.67 (s, 1 H) 3.78 (s, 3 H) 3.70 (s, 3 H) 3.69 (br. s., 3 H). m/z (APCI+) for C11H13FN7O 278.2 (M+H)+. To a stirred suspension of 2-fluoro-N-(3-methoxy-1-methyl-1H-pyrazol-4-yl)-9-methyl-9H-purin-6-amine (554 mg, 2.00 mmol, 1.00 eq) and N-((3R,4R)-4-fluoropyrrolidin-3-yl)-3-(methylsulfonyl)propanamide (500 mg, 2.10 mmol, 1.05 eq) in DMSO (4.2 mL) was added N,N-diisopropylethylamine (0.83 mL, 5.00 mmol, 2.50 eq). The reaction mixture was then heated at 100° C. for 16 hr, cooled to ambient temperature, diluted with THF (4 mL), and treated with potassium tert-butoxide (4.00 mL, 1 M in THF, 2.00 eq). After 1 hr, an additional portion of potassium tert-butoxide (0.50 mL, 1 M in THF, 0.25 eq) was added to the reaction mixture. After a further 1 hr, the reaction mixture was poured into phosphate buffer (50 mL, pH=7) and water (50 mL), and extracted with ethyl acetate (5×40 mL). The combined organic layers were combined, dried (Na2SO4), and concentrated under reduced pressure. This crude product was then dissolved in ethyl acetate (40 mL) at 60° C. and then treated with heptanes (20 mL), at which point the solution became cloudy and was allowed to cool to ambient temperature and then to 0° C. After 16 hr at 0° C., the resulting solids were filtered and dried at ambient temperature to give the title compound (620.5 mg, 75% yield) as a white powder. 1H NMR (400 MHz, DMSO-d6) δ ppm 8.44 (d, J=6.5 Hz, 1 H) 7.97 (s, 1 H) 7.82 (s, 1 H) 7.78 (s, 1 H) 6.23 (dd, J=10.0, 17.0 Hz, 1 H) 6.14 (dd, J=2.8, 17.0 Hz, 1 H) 5.62 (dd, J=2.8, 10.0 Hz, 1 H) 5.12 (d, J=51.0 Hz, 1 H) 4.46 (td, J=6.0, 11.9 Hz, 1 H) 3.88-3.6 (m, 4 H) 3.82 (s, 3 H) 3.71 (s, 3 H) 3.62 (s, 3 H). m/z (APCI+) for C18H23FN9O2 416.3 (M+H)+. A mixture of xylene, (1.2 L), benzylamine (120 g, 1.10 mol, 1.0 eq) and L-(+)-tartaric acid (173 g, 1.15 mol, 1.05 eq) were heated at 135° C. for 12 hr (flask jacket temperature). Upon reaction completion, the mixture was cooled to 65° C. and MeOH (120 mL, 1 vol) was added. The resulting mixture was stirred for 1 hr and the resulting suspension was cooled to 20° C. followed by the addition of EtOAc (480 mL). Stirring was continued at 10° C. for 2 hr. The crude product was isolated by filtration and washed with EtOAc (120 mL) and dried on the filter. The crude product was then taken up in MeOH (480 mL) and heated at a gentle reflux for 1 hr, then cooled to 20° C. and granulated for 1 hr. The suspension was filtered and the precipitate washed with MeOH (240 mL) and dried to give the title compound (191 g, 864 mmol, 79%) as a white granular solid. 1H NMR (400 MHz, DMSO-d6) δ ppm 7.38-7.30 (m, 2H) 7.30-7.22 (m, 3 H) 6.32 (br. s., 1 H) 4.59 (d, J=14.8 Hz, 1 H) 4.53 (d, J=14.8 Hz, 1 H) 4.40 (br. D., J=4.3 Hz, 2 H). m/z (EI+) for C11H11NO4 221.0 (M)+. To a mixture of (3R,4R)-1-benzyl-3,4-dihydroxypyrrolidine-2,5-dione (44 g, 199 mmol, 1.0 eq) and THF (176 mL) at 20° C. (vessel jacket temperature) was added borane-tetrahydrofuran complex (1.0 mol/L) in THF (800 mL, 800 mmol, 1.0 mol/L, 4.0 eq) at a rate to maintain the temperature between 20° C. and 25° C. Over 1 hr, the jacket temperature was ramped to 60° C. and then held for 1 hr. Upon completion, the reaction was cooled to 30° C. and quenched by the slow dropwise addition of MeOH (97 mL, 12 eq) to the mixture at a rate to control off gassing. The reaction mixture was then heated to reflux and concentrated to a low stir volume. The reaction solvent THF was then replaced by a constant volume displacement with MeOH (total of 1.5 L). Once the THF content had been reduced to less than 1 wt %, MeOH was replaced by a constant volume displacement with EtOAc (total of 1.5 L) to reduce the MeOH content to less than 1 wt %. The total volume of EtOAc was then readjusted to about 250 mL (6 vol) and then cooled to 5° C. to crystallize the product. The desired product was isolated by filtration, washed with cold EtOAc (88 mL) and dried to give title compound (27.0 g, 140 mmol, 70%). A second crop of product was isolated by concentration of the combined filtrate and cake wash to half volume, which was then cooled to 5° C., filtered and washed with cold EtOAc (50 mL) to afford additional title compound (4.5 g, 23 mmol, 12%). 1H NMR (400 MHz, DMSO-d6) δ ppm 7.33-7.26 (m, 4 H) 7.25-7.20 (m, 1 H) 4.48 (d, J=4.8 Hz, 2 H) 3.38-3.31 (m, 2 H), 3.57 (d, J=13.0 Hz, 1 H) 3.46 (d, J=13.0 Hz, 1 H) 2.74 (dd, J=9.4, 5.9 Hz, 2 H) 2.30 (dd, J=9.4, 4.4 Hz, 2 H). m/z (EI+) for C11H15NO2 194.2 (M+H)+. To a 5 L jacketed reactor (Reactor 1) was added 1,4-dioxane (1.8 L), (3S,4S)-1-benzylpyrrolidine-3,4-diol (180 g, 0.932 mol, 1.0 eq) and TEA (792 mL, 5.68 mol, 6.1 eq) and the resulting mixture stirred at 10° C.
To a 2 L jacketed reactor (Reactor 2) was added 1,4-dioxane (1.6 L) and chlorosulfonyl isocyanate (596 g, 2.80 mol, 3.0 eq) and the resulting solution was cooled to 10° C. A solution of tert-butanol (211 g, 2.85 mol, 3.05 eq) in 1,4-dioxane (180 mL) was added over 45 min while maintaining the temperature between 10° C. and 20° C., and the resulting solution was then stirred for 15 min at 10° C.
The solution in Reactor 2 was transferred to Reactor 1 over 50 min while controlling the internal temperature of Reactor 1 from 10° C. to 20° C. Once the addition was complete, the jacket temperature was warmed at 20° C. and the resulting mixture was stirred for 16 hr. When UPLC analysis confirmed that the bis-alkylated intermediate was fully formed (target <3% mono-alkylated intermediate), the entire batch was filtered and the filtrate was sent into a clean reactor. The residual TEA-HCl cake was washed with dioxane (300 mL) and the wash was combined with the filtrate. The resulting dioxane solution was then heated to 80° C. and held for 3 hr. After sampling for reaction completion (<1% intermediate remaining), the batch was distilled (pot temp=80° C.) under partial vacuum (400 mbar) to less than half volume. The reaction mixture was diluted with EtOAc (2 L) and washed twice with water (2×2 L). The mixture was then washed with 0.5 N sodium bicarbonate (2 L) and then dried over sodium sulfate (360 g, 2 wt eq) and filtered into a clean dry reactor. The EtOAc solution was concentrated under partial vacuum to about 400 mL total volume resulting in the formation of a thick slurry. The mixture was cooled to 0° C. and stirred for 1 hr and then filtered and washed with cold EtOAc (200 mL) and then dried in a vacuum oven at 40° C. to give 173 g of the title compound. A second crop of product was isolated by concentrating the filtrate and then cooling, granulating and filtering to give an additional 28.4 g of the desired product. In total, the title compound was isolated in 61% yield (201 g, 568 mmol). 1H NMR (400 MHz, DMSO-d6) δ ppm 7.37-7.29 (m, 4 H) 7.29-7.23 (m, 1 H) 5.36 (dd, J=7.3, 3.8 Hz, 1 H) 4.79-4.73 (m, 1 H) 4.48 (d, J=4.8 Hz, 2 H) 3.38-3.31 (m, 2 H), 3.70 (d, J=13.4 Hz, 1 H) 3.62 (d, J=13.4 Hz, 1 H) 3.13-2.99 (m, 2 H) 2.48-2.40 (m, 2 H) 1.46 (s, 9 H). m/z (EI+) for C16H22N2O5S 355.2 (M+H)+. A solution of 1M tetrabutylammonium fluoride in THF (1.27 L, 1.27 mol, 2.5 eq) and (3aR,6aS)-5-benzyl-2,2-dioxo-tetrahydro-1-oxa-2λ6-thia-3-5-diaza-pentalene-3-carboxylic acid t-butyl ester (180 g, 0.508 mol, 1.0 eq) were heated at 60° C. (jacket temperature) for 2 hr. Upon reaction completion, the mixture was partially distilled under vacuum to remove the THF. After concentration to a low stir volume, THF was displaced with EtOAc (2×500 mL). After again reducing to a low stir volume, EtOAc (3.6 L) and p-toluenesulfonic acid monohydrate (396 g, 2.10 mol, 4.1 eq) were charged and heated at 80° C. for 2 hr. The mixture was cooled to 10° C. over 1.5 hr and then granulated at 10° C. for 2 hr. The solid product was filtered and washed with EtOAc (2×900 mL) and dried at 50° C. in a vacuum oven for 12 hr. The title compound was isolated as an air stable crystalline solid in 83% yield (231 g, 419 mmol). 1H NMR (400 MHz, D2O) δ ppm 7.69-7.61 (m, 4 H) 7.56-7.42 (m, 5 H) 7.36-7.29 (m, 4 H) 5.65-5.49 (m, 1 H) 4.47 (br. s., 2H) 4.37-4.23 (m, H) 4.15 (ddd, J=12.8, 8.2, 1.4 Hz, 1 H) 3.88 (dd, J=19.1, 1.2 Hz, 1 H), 3.74 (ddd, J=33.2, 14.0, 5.5 Hz, 1 H) 3.44 (dd, J=12.8, 8.2 Hz, 1 H) 2.34 (s, 6 H). m/z (EI+) for C11H15FN2 194.8 (M+H)+. A suspension of 1,1′-carbonyldiimidazole (73.0 g, 441 mmol, 1.1 eq) in acetonitrile (3.3 L) was stirred at 20° C. until a clear solution was obtained. 3-(methylsulfonyl)propanoic acid (67.0 g, 440 mmol, 1.1 eq) was then added and the mixture was stirred at 25° C. for 3 hr. (3R,4R)-1-benzyl-4-fluoropyrrolidin-3-amine bis-tosylate (220 g, 400 mmol, 1.0 eq) was added and the mixture was stirred at 25° C. for 16 hr resulting in a fine white slurry. The solids were filtered off and the byproduct cake washed with acetonitrile (600 mL). The acetonitrile solution was then concentrated to a low stir volume and then taken up in EtOAc (2.0 L) and washed with 1 N aqueous sodium bicarbonate (1.3 L). The aqueous layer was back extracted with EtOAc (500 mL) and the combined EtOAc layers were washed with water (1.0 L). The resulting EtOAc solution was distilled to remove about 2.0 L of distillate and then displaced with 2-propanol under atmospheric conditions until the internal temperature rose to 78° C. while maintaining a total volume of 2 L. The batch was then cooled to 20° C. and granulated at 20° C. for 12 hr resulting in product crystallization. The desired product was isolated by filtration and the cake washed with 2-propanol (600 mL), then dried in an oven at 40° C. under reduced pressure for 12 hr. The title compound (108 g, 308 mmol) was isolated in 77% yield. 1H NMR (400 MHz, DMSO-d6) δ ppm 8.36 (br. d., J=7.0 Hz, 1 H) 7.37-7.29 (m, 4 H) 7.29-7.23 (m, 1 H) 4.90 (ddt, J=53.4, 5.3, 2×1.7 Hz, 1 H) 4.25 (dddd, J=26.4, 13.9, 7.0, 1.4 Hz, 1 H) 3.61 (d, J=13.2 Hz, 1 H) 3.57 (d, J=13.2 Hz, 1 H) 3.36-3.28 (m, 2 H) 3.03 (dd, J=9.3, 7.5 Hz, 1 H) 2.97 (s, 3 H) 2.80 (dd, J=24.0, 11.6 Hz, 1 H) 2.66 (ddd, J=30.6, 11.6, 5.3 Hz, 1 H) 2.57 (td, 2×7.7, 1.4 Hz, 2 H) 2.18 (dd, J=9.4, 6.7 Hz, 1 H). m/z (EI+) for C15H21FN2O3S 329.7 (M+H)+. To a Parr reactor was added N-((3R,4R)-1-benzyl-4-fluoropyrrolidin-3-yl)-3-(methylsulfonyl)propanamide (86.5 g, 263 mmol, 1.0 eq), palladium hydroxide (20% on carbon, 2.59 g, 3.69 mmol, 3 wt/wt %) and MeOH (430 mL). The reactor was purged three times with nitrogen (50 psi) and then purged three times with hydrogen (20 psi). The reactor was heated at 50° C. and then pressurized to 50 psi while stirring at 1200 rpm. The material was hydrogenated for 7 hr and then cooled to 20° C. and purged with nitrogen. The mixture was filtered to remove the catalyst and the cake was washed with MeOH (173 mL). The combined filtrate and wash were concentrated to about 200 mL followed by addition of MTBE (200 mL) and then concentrated to a low stir volume. Additional MTBE (200 mL) was added and the resulting slurry granulated at 20° C. for 16 hr. The desired product was isolated by filtration, washed with MTBE (300 mL) and then dried in an oven at 40° C. for 12 hr. The title compound was isolated in 90% yield (53.3 g, 224 mmol) as a white crystalline solid. 1H NMR (400 MHz, DMSO-d6) δ ppm 8.15 (br. d., J=6.8 Hz, 1 H) 4.96-4.78 (m, 1 H) 4.14-4.01 (m, 1 H) 3.32 (dd, J=8.0, 7.3 Hz, 2 H) 3.13 (dd, J=11.8, 6.8 Hz, 1 H) 3.01-2.93 (m, 1 H) 2.98 (s, 3 H) 2.88 (d, J=3.0 Hz, 1 H) 2.60 (br. s., 1 H) 2.5 7-2.52 (m, 3 H). m/z (EI+) for C8H15FN2O3S 239.1 (M+H)+. A suspension of 6-chloro-2-fluoro-9H-purine (88% potency, 5.90 kg, 30.20 mol, 1.00 eq), 3-methoxy-1-methyl-1H-pyrazol-4-amine hydrochloride (98% potency, 5.55 kg, 33.22 mol, 1.10 eq), and sodium bicarbonate (10.1 kg, 120.81 mol, 4.00 eq) in EtOAc (106 L) was stirred at 50° C. for 12 hr. The reaction mixture was then cooled to 20° C., granulated for 1 hr, filtered, and the solids were washed with EtOAc (18 L) and dried on the filter. The crude product was charged back into the reactor and suspended in water (106 L) and stirred at 35° C. for 2 hr. The resulting slurry was cooled to 20° C. and the desired product was isolated by filtration and the cake was washed with water (30 L) and then with EtOAc (30 L) and dried for 16 hr at 50° C. to give the title compound (6.26 kg, 23.8 mol, 79% yield) as a light yellow solid. 1H NMR (400 MHz, DMSO-d6) δ ppm 13.03 (br. s., 1 H) 9.21 (br. s., 1 H) 8.18 (br. s., 1 H) 7.74 (br. s., 1 H) 3.81 (br. s., 3 H) 3.71 (s, 3 H). m/z (APCI+) for C10H11FN7O 264.2 (M+H)+. To a 100 L reactor fitted with a caustic scrubber was added 2-methyltetrahydrofuran (44.0 L), 2-fluoro-N-(3-methoxy-1-methyl-1H-pyrazol-4-yl)-9H-purin-6-amine (2.20 kg, 8.36 mol, 1.00 eq) and potassium phosphate tribasic (7.10 kg, 33.43 mol mmol, 4.00 eq). The resulting mixture was stirred at 5° C. and dimethyl sulfate (1.42 kg, 11.28 mol, 1.35 eq) was added and the resulting mixture was stirred at 5° C. for 1 hr. The reaction was warmed from 5° C. to 15° C. over 2 hr and then held at 15° C. for 20 hr. The reaction mixture was cooled to 5° C. and quenched with water (44.0 L) while maintaining the internal temperature below 10° C. The mixture was then heated at 50° C. for 2 hr and then cooled to 10° C. and granulated for 2 hr. The product was isolated by filtration and washed with water (11.0 L) and then with 2-methyltetrahydrofuran (11.0 L). The cake was dried under vacuum at 40° C. for 8 hr to give the title compound (1.99 kg, 7.18 mol, 86% yield) as an off white solid. 1H NMR (400 MHz, DMSO-d6) δ ppm 9.23 (br. s., 1 H) 8.13 (br. s., 1 H) 7.67 (s, 1 H) 3.78 (s, 3 H)3.70 (s, 3 H) 3.69 (br. s., 3 H). m/z (APCI+) for C11H13FN7O 278.2 (M+H)+. To a 200 L Hastelloy reactor heated to 40° C. was added sulfolane (22.4 L) and N-((3R,4R)-4-fluoropyrrolidin-3-yl)-3-(methylsulfonyl)propanamide (4.03 kg, 16.9 mol, 1.05 eq) and stirred the resulting mixture until all solids were dissolved. To this solution was added 2-fluoro-N-(3-methoxy-1-methyl-1H-pyrazol-4-yl)-9-methyl-9H-purin-6-amine (4.47 kg, 16.1 mol, 1.00 eq) and N,N-diisopropylethylamine (8.50 L, 48.7 mol, 3.0 eq) and the mixture heated at 115° C. for 16 hr. The reaction mixture was cooled to 30° C., and a solution of potassium hydroxide (2.26 kg, 40.3 mol, 2.5 eq) in water (44.7 L) was added. After stirring for 4 hr, the reaction mixture was cooled to 20° C., water (44.7 L) was added and the resulting mixture granulated for 12 hr. The crude product was isolated on a Nutsche filter and washed with water (27 L) and then dried under nitrogen on the filter. The reactor was cleaned and then charged with water (35.8 L) and acetone (53.6 L). The crude product cake was charged back into the reactor and heated to 60° C. until all of the solids had dissolved. The batch was then cooled to 40° C. and then transferred into a speck free 100 L reactor via an in-line 10 μm filter. The 200 L reactor, line and filter were rinsed with acetone (5 L) and sent into the 100 L reactor. The batch was concentrated with the jacket temperature set at 70° C. under partial vacuum until the acetone content reduced to 5 wt %, as determined by gas chromatography head space. The batch was then cooled to 20° C. and granulated for 4 hr. The product was filtered, washed with water (18 L) and dried in a vacuum oven at 55° C. for 8 hr. The title compound (3.942 kg, 9.49 mol, 59%) was isolated as a white crystalline solid. 1H NMR (400 MHz, DMSO-d6) δ ppm 8.44 (d, J=6.5 Hz, 1 H) 7.97 (s, 1 H) 7.82 (s, 1 H) 7.78 (s, 1 H) 6.23 (dd, J=10.0, 17.0 Hz, 1 H) 6.14 (dd, J=2.8, 17.0 Hz, 1 H) 5.62 (dd, J=2.8, 10.0 Hz, 1 H) 5.12 (d, J=51.0 Hz, 1 H) 4.46 (td, J=6.0, 11.9 Hz, 1 H) 3.88-3.6 (m, 4 H) 3.82 (s, 3 H) 3.71 (s, 3 H) 3.62 (s, 3 H). m/z (APCI+) for C18H23FN9O2 416.3 (M+H)+.